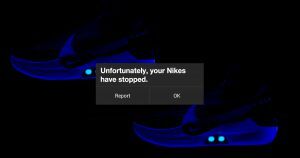 Unfortunately, a great way to generate ridicule for your futuristic tech product is to totally break it with a software update, which is also what Nike just did with the aforementioned sneakers, according to The Verge. The $350 shoes were first sold on Sunday. And now, thanks to an update to the app people can use to tighten or loosen the shoes, Android and iPhone users are running into several different bugs that keep them from using it at all. Some people report that they can only pair one shoe with their app. Others say that the motors that tighten and loosen the shoes have stopped working altogether, according to The Verge. That means that the very expensive shoe is just about as useful as a slipper. While we all hope to someday see true hoverboards and self-lacing clothes, for now it seems we’re stuck with just another dumb IoT app.